The Choppiness Index (CI) was authored by Australian commodity trader E.W. Dreiss. The CI may be used to determine if the market is consolidating or trending. The Choppiness Index (CI) is an indicator which attempts to distinguish between trending and sideways markets. Many indicators which determine trend are called directional indicators, meaning they show whether the market is in an uptrend or a downtrend. This indicator shows whether the market is trending or not, and that trend can be up or down; it doesn’t matter. It is up to the trader to use it to confirm their view of the market they are trading. With this indicator, higher values mean more choppiness, and lower values mean directional or trend trading. See the weekly S&P Index above and notice the trending areas in red and the choppy areas in blue. The formula variables include the Average True Range over the past n candles, as well as the highest high over the past n candles. The values always fall within a certain range between 0 and 100. The closer the calculation is to 0, the stronger the market is trending. The thresholds used to determine trending or sideways are Fibonacci ratios. Any number above 61.8 signifies sideways or choppy markets, and any number below 38.2 identifies with a trending market, whether up or down. The upper zone is chop and the lower zone is trend. This indicator is more of a confirmation, since it lags, then a leading indicator; nonetheless, it can be a useful, visual representation of the market cycle. To illustrate this tool, look at the 4-hour chart below of the S&P500 index. The 50 line is comparable to the zero line with most oscillators; a move above 50, in blue territory, is a move towards a sideways or choppy market, which is confirmed above 61.8. Similarly, a move below 50, in red territory, is a move towards a trending market, which is confirmed below 38.2. The crossing of the 50 mark can be used as a heads up. 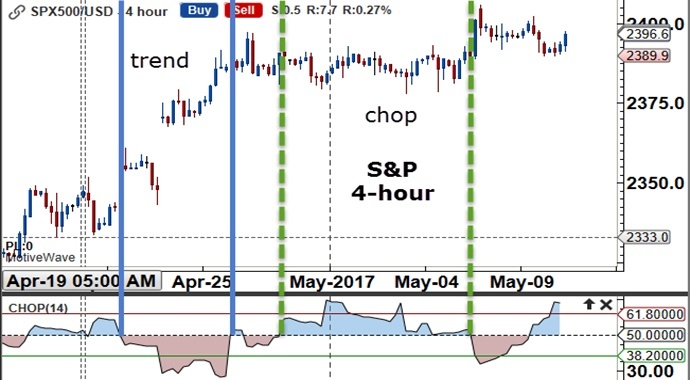 Identify the trend and chop areas in the 4-hour S&P chart below and notice how price responds within those red and blue histogram sections. The Index can be used to anticipate changes in the market cycle. Typically, if the market is trading sideways for an extended period, it is usually followed by a trend move and is just a matter of time. Therefore, the 50 line becomes important as the first sign of a change in the market cycle from trend to sideways or from sideways to trend. The market alternates between trends and consolidations and traders can use this index on a smaller time frame to get into the trend on the bigger time frame. In this example, the trader can look at the strong trend on the weekly chart, and look to enter long on the 4-hour chart using the Choppiness Index. 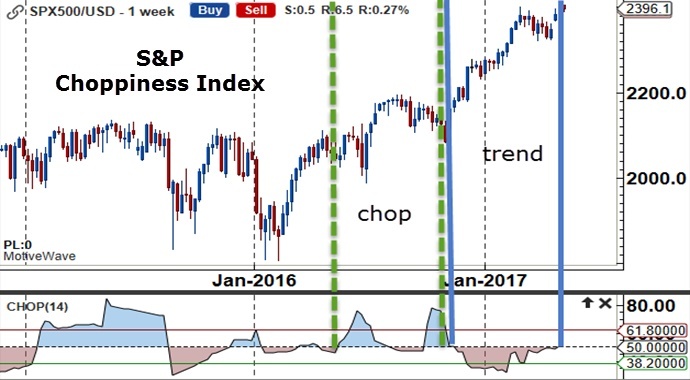 Learn how the Choppiness Index helps keep traders in the trend longer, also alerting traders when the market is sideways. Start incorporating the Choppiness Index into your chart set-up. Finally, use the Choppiness Index in developing trading strategies. This entry was posted in Trading Tips and tagged Choppiness Index, day trading, Indicator Toolbox – Choppiness Index, indicators, market analysis, trading, trading plan, trading strategy, trading system, Weekly analysis.